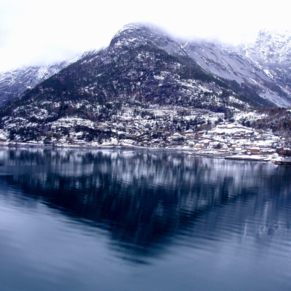 Eidfjord is perched at the end of the Hardangerfjord. Located on the official tourist route, Eidfjord is a great place to see Hardangervidda National Park, the highest mountain plateau in Northern Europe. The natural scenery of the area is splendid. 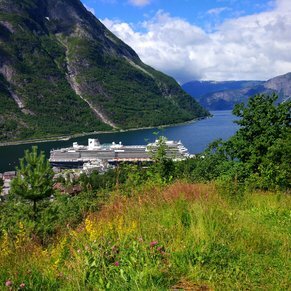 The central placement of Eidfjord makes for convenient access to Bergen and Oslo. Kayaking was beautiful despite rain . Bro good rain gear . Scenery was beautiful ! I loved this charming port. There is some shopping right in the town where we tendered. Originally, we were scheduled to dock in town. 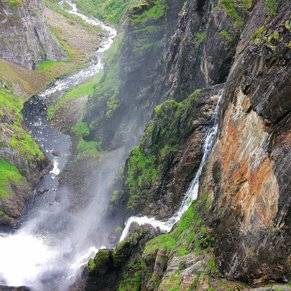 We took a HAL excursion, Eidfjord Cruise & Voringsfossen Waterfall. Unfortunately, when we arrived at the waterfall, it was surrounded in fog but just before we left, the fog cleared and we got some good photos. There is a large souvenir shop at the waterfall and the lovely Fossli hotel located at the far end of the Upper Eidfjord Lake. The cruise in the fjord was wonderful. The sun shone the entire time. .
Beautiful fjord. We did the hike to the Viking burial grounds. You have to go uphill at some point and it's rather steep. The walk along the river is level up until the last 800m of uphill climb to the plateau. Lovely to walk to the lake if you just want to do that and the trail is accessbile if pushing someone in a wheelchair. The pathway is wide and is made of compacted gravel, well maintained when we were there. Should be manageable if dry. This is just a comment from previous experience when traveling with someone who would love to see the sights but mobility impaired. You would not be able to do the uphill then downhill portion pushing a wheelchair in that case take the little troll train, views are beautiful. Buy a gallon of spring water for the boat at the Joker market for about US$5.00. Best scenery and sailaway in the whole cruise. Gorgeous. Took the train to Flam which was a little unorganized. 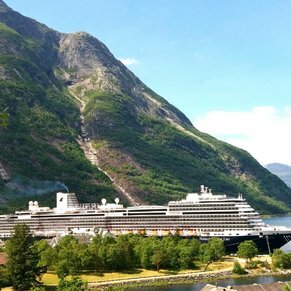 There are currently 0 discussions about Eidfjord, Norway.